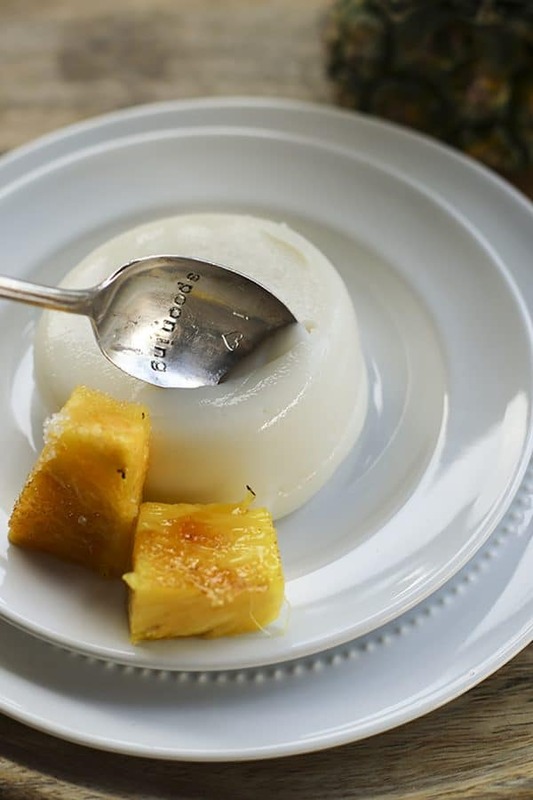 Piña Colada Tembleque or Pineapple Coconut Pudding is a fun twist on a traditional Puerto Rican summertime dessert. Tembleque is usually a chilled coconut milk pudding (dairy free!) served with a sprinkling of cinnamon on top. I do love it on a sweltering summer day; but to celebrate National Piña Colada Day, I thought I’d introduce a little pineapple fun to the tembleque party in the form of pineapple juice and pineapple vodka. The pineapple vodka is strictly optional if you try to avoid alcohol, but does lend a nice little something something to the tembleque. For those of you who -like me- didn’t have the benefit of growing up with tembleque, let me take a moment to describe it a little. If you think panna cotta but with coconut milk you’re on the right track. If this still leaves you scratching your head, think of it as a firm set custard that you can cut with a spoon. And if that doesn’t help, can I just suggest making it and eating it? Because if you’re a fan of Piña Coladas you’re going to be a fan of Piña Colada Tembleque. This recipe is beyond simple, but the simplest things require accuracy in ingredients. Do not substitute low fat or sweetened coconut milk for the full fat unsweetened coconut milk. Trust me. It will make you sad. Dessert is not a place to get freaked out about fat. Use whichever pineapple juice dings your chimes, but do make sure it’s 100% pineapple juice, please. The pineapple vodka, as I mentioned earlier, isn’t really obligatory, but it does add another subtle layer of pineapple flavour. If you want to omit it, consider replacing it with pineapple nectar. This is often available under the Goya brand. This may sound weird, but don’t skip wetting the inside surface of the mold, pan, or ramekins before pouring in the custard. The custard should be pretty thick when you pour it into the mold (pan) or ramekins but not so thick that the tops can’t be smoothed. Cover with plastic wrap and chill thoroughly. This is not a time to be impatient. I would chill for at least 4 hours or overnight. 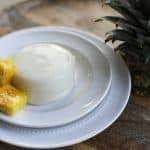 Do you NEED to serve brûléed pineapples with the pineapple coconut pudding? No. I guess not. Will you be happy if you do? Simply put; yes. Less simply put; you’ll be as happy as a unicorn jumping over the rainbow that has a pot of gold and a friendly leprechaun who is trained in shiatsu massage at end of it. The burnt sugar and caramelized pineapple pieces play so very nicely together. 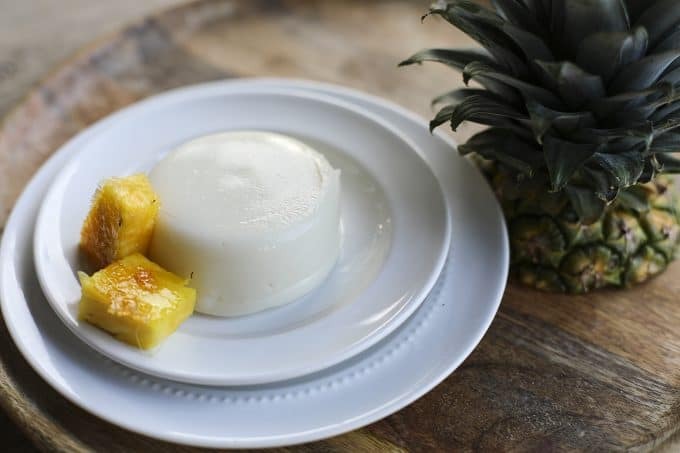 Piña Colada Tembleque - Pineapple Coconut Pudding is exactly how you want to cool down on a super hot day; creamy, just sweet enough, and redolent of pina colada flavours is a taste of Puerto Rico. 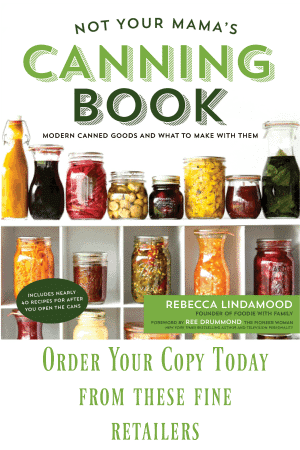 Wet the inside of 6 (4 ounce) ramekins or a 5 to 6 cup capacity heat-proof bowl or mold and set aside. In a heavy-bottomed saucepan, whisk together the sugar, cornstarch, and salt until everything is evenly distributed. Whisk in the coconut milk until smooth, then the pineapple juice and pineapple vodka. When the cornstarch is fully whisked into the liquids and is smooth, place the pan over medium high heat. Cook, whisking gently and constantly, until the mixture comes to a gentle boil and becomes smooth and thick. 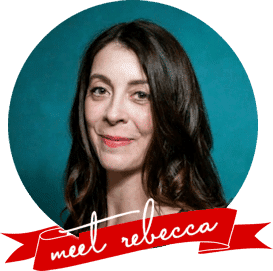 Immediately pour into the prepared ramekins or bowl, cover with plastic wrap, and refrigerate for at least 4 hours, or until chilled completely and firm. Run a thin, flexible knife or spatula around the inside of the mold. Place a plate on top of the mold or ramekin and hold it there as you invert the bowl onto the plate. Tap the bowl or ramekin until the tembleque releases onto the plate. Place a rimmed sheet pan or cookie sheet on a heat-proof surface and arrange pineapple pieces over it. Sprinkle the pineapple pieces with granulated or raw sugar and pass a lit culinary torch back and forth over it until the sugar bubbles and browns in places. Serve two or three bruleed pineapple pieces alongside each tembleque. We love homemade pudding, but I’ve never tried making it with coconut milk. Sounds delish! This looks so delicious! And that bruleed pineapple on the side… yum! 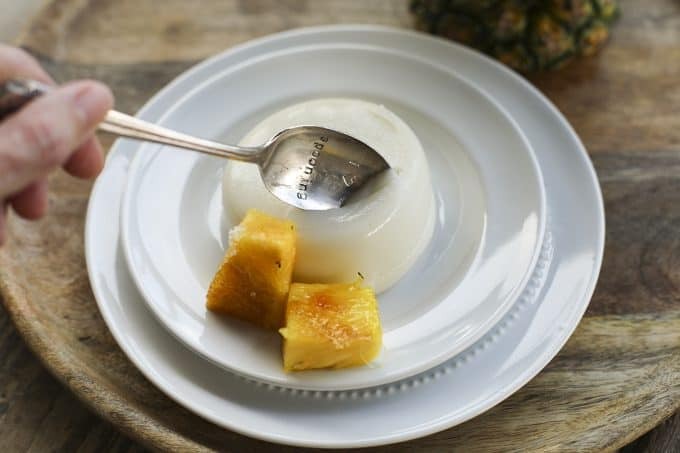 Wow, this pineapple-coconut pudding looks like a piece of heaven! I’m going to try the recipe for sure, my kid would love it! It sounds like it’s very similar to Haupia, a Hawaiian coconut pudding, which I make regularly. But the addition of pineapple juice sounds amazing! I will have to give it a shot! Thanks! I hope you enjoy it, Hawk!